Explore a busy burgh, or town, solve challenges along the way - and win an invitation to a castle banquet! 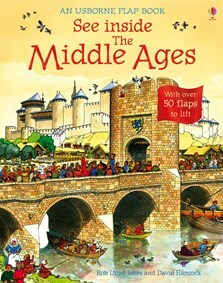 Visit an imaginary castle and find out more about life in the Middle Ages. Watch a video clip about how to catch a rat in medieval times. Scroll through the menu on the right for other clips including "How to Arm A Knight", "How to Knock Down A Castle Wall" and "How to Fire A Bow and Arrow". Destroy the castle with an online trebuchet! An illustrated guide to castles. An animated guide to Weoley Castle, a medieval manor house with many castle features. See fabulous panoramic views of the cathedral, Notre Dame, built in Paris during the 12th -13th centuries. Restore a medieval cathedral to its former glory. Find out what people ate in the Middle Ages.